If you have played around with dimensional constraints, you have noticed that they look very different than regular dimensions. In fact, they are so different that they are not presentable. Well… they will be presentable after reading this tutorial. In the “Dimensional” panel on the “Parametric” ribbon, click the “Linear” dimensional constraint button. A pickbox will appear, and if you hover over a line, a red x will appear at the end of the line that the “dim” will measure from. Click to accept and do the same for the other side of the line. In the “Dimensional” panel on the “Parametric” ribbon, click the “Convert” button. Pick the dims that you want to convert. After selecting, hit <enter>. The dims will now be converted. These new dims are very functional, but not very presentable, so let’s fix that. What we will do is change the constraint to not show the lock symbol, the “d1=” (name of the constraint), and put it back to the layer & color as it originally looked like when it was created. 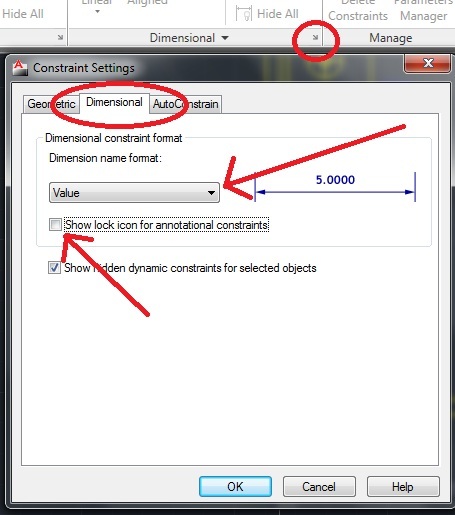 In the lower right corner of the “Dimensional” panel on the “Parametric” ribbon, click the diagonal arrow to open the “Constraint Settings” dialog. Notice that the name (prefix) of “d1=” has been removed but the lock symbol may still be visible and the color/layer is not correct yet. Exit the Properties palette and your once un-presentable Dimensional Constraints are now presentable. This entry was posted in Customization, Dimensions, Modifying, TIPS. Bookmark the permalink. 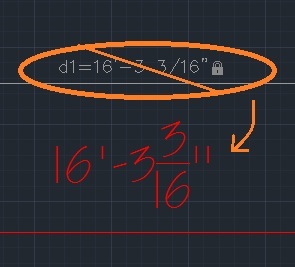 I was just wondering if someone could help me?….I am new to AutoCAD and am wondering if it is possible to print out the constraints?…..and if it is possible how do you do it? I don’t think that this is possible. Do you mean, you want the constraint icons (badges) to print? If so, I think that the only way to document those is to do a screen capture.